This is my family’s favorite soup. It is simple, very quick to make and tastes amazing. I make a big pot as it always disappears pretty quickly. Perfect food for rainy days, lazy days, movie days, or days when you are just too tired to spend a lot of time in the kitchen. The toppings really take the soup to the next level so be creative! – 5 cups beans (kidney, black, white…your choice). I am hoping one day to be organized enough to have cooked beans bagged in my freezer, but for today I cheated and used organic canned. If using canned make sure you drain and rinse well. If you use canned this is equivalent to 2-19oz cans. – 2 cups corn, fresh, frozen or 1-19oz can. As corn is the most common GMO crop choose organic! If you can only afford to buy one organic ingredient for this, make it corn! Turn the heat up to high and bring to a boil. Reduce heat and simmer 15 minutes for the flavours to blend. Flavours improve over time. I like to throw everything in the pot in the morning and leave simmering until we are ready to eat. When you are ready to eat, turn heat off and add reserved cilantro leaves (chopped). Set up toppings and have each guest build their own bowl. Carnivores can replace the stock with water and add 2 free range whole (thigh attached) chicken legs to the soup. Bring to a boil as usual and simmer until chicken is cooked. Remove chicken to cutting board, shred meat with 2 forks. Add meat to soup and discard bones. 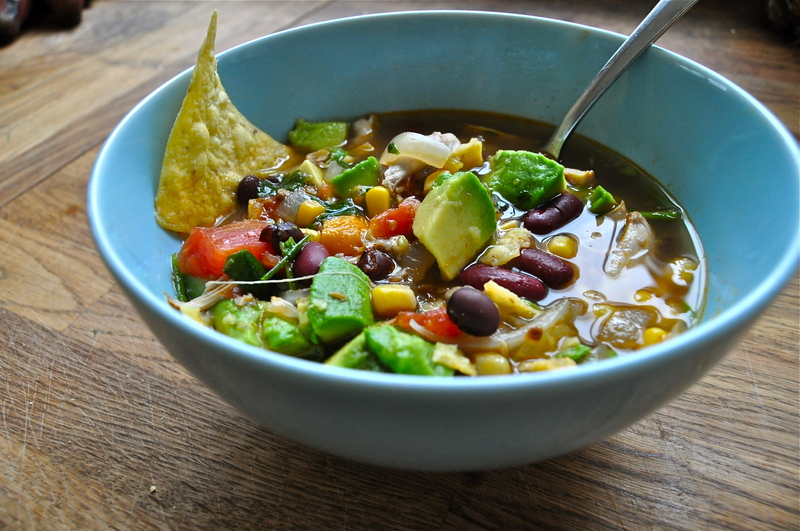 This entry was posted in vegan, vegetarian and tagged dairy free, easy, fast, food, fresh, gluten free, healthy, nacho soup, quick, recipe, soup, stew, summer, taco soup, tortilla soup, vegan, vegetarian. Bookmark the permalink. I just made it; it was sooooo good! !